When it comes to buying a mattress you should take your time to consider the options. There are a wide variety of products to choose from and you don’t want to end up getting something you’ll regret. At John Ryan By Design we sell high-grade mattresses that are designed to give you the best hand-made mattress you can get for your money. We’ve built our reputation around our knowledge, respect and integrity. Mattresses are our passion, so we want you to be able to understand every aspect of the buying process. We’ll answer any questions you have on size, material, build quality and feel. After you know everything there is to know, you’ll be able to make an informed decision. Our extensive product range includes a collection of extra king zip and link mattresses. This kind of mattress utilises bars and zippers to create a unique bed. The zips and bars can be linked or separated, resulting in two singles or one big bed. Extra king zip and link mattresses can be crafted with alternative spring tensions on each side, making them suitable for people of all body sizes. 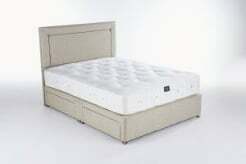 What are the dimensions of zip and link mattresses? What types of extra king zip and link mattresses do we offer? For someone who wants an affordable mattress, our Origins Pocket 1500 is a great choice. Coming with a three year guarantee, this mattress is comfortable and excellent value for money. Another popular mattress is the Artisans Natural, made from 85% Natural Fibres. The Calico covering ensures extra support, while the ten year guarantee means you’ll have a long-lasting experience. Such is our faith in the Artisans Natural, we believe this product is where we stake our claim as mattress specialists. We believe in offering a personal service that goes beyond selling mattresses. We want our customers to know we deliver our promises on time and right first time with high quality and superior performance. We’ll make sure you understand spring tension, material and the number of pocket springs. No detail is irrelevant. A crucial part of our business is the 60 day ‘Love It or Return It’ guarantee. If you aren’t happy with a mattress after 60 days then we’ll collect it free of charge and give you a full refund. We’re not interested in making quick money. We want you to be completely satisfied with your new mattress. If you’d like to know more about our mattresses then we’re available to chat over the phone. Get in touch on 0161 437 4419.